SO YOU THINK YOU KNOW WHAT JESUS LOOKED LIKE? Here is an image of Jesus from a Byzantine coin of the second reign of Justinian II, 705-711 c. e. Not what you expected? 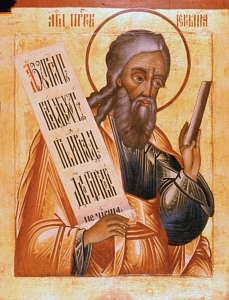 I have said previously that the standard image of Jesus present in Eastern Orthodox, Western Catholic, and in much of Protestant art (with some recent exceptions) — the image with long hair, a long, thin nose, and a moustache and medium-length beard — was something created in Christianity as it became more and more deeply associated with the Roman (and Byzantine) State. But you may be surprised to learn, as the gold Byzantine coin on this page shows, that the manner in which Jesus was depicted was still not firmly fixed as late as the beginning years of the 700s. This Jesus does not have the “Hellenic” look of what later became accepted as the standard image of Jesus. Instead, the characteristics of Jesus in this solidus are more typical of what a Semitic Jesus might really have looked like, though again, of course, only in a general way. There is even a story recorded by the historian Theodorus Lector that a man once painted a portrait of Jesus according to the “Zeus” type, (the Hellenic type) and that Heaven punished him for it by shrivelling his hands. That just confirms that the notion held by many modern art historians — the idea that the long hair and general appearance of the Hellenic type was partly based on that of the Greek God Zeus (Jupiter to the Romans) — is not just a modern theory. In addition, Theodorus Lector remarks in his Church History (1:15) that the image of Jesus with “wooly” (oulon) and short (oligotrikhon) hair (the “Semitic” type) was, of the two types, the most authentic image. Theodorus Lector (literally, “Theodorus the Reader”) was a reader in the great Church of Holy Wisdom (Hagia Sophia) in Constantinople in the first part of the sixth century. In short, both the Semitic and Hellenic types of Christ image were in use in the sixth and early seventh centuries. And they are obviously very different images. Of course we know which type eventually became the favored image of the government and the religious authorities. The “Semitic” Christ image faded from use and the “Hellenic” image, so much more “Greek” and “classical” in appearance, won out and became the image of Christ that most people recognize as “Jesus,” though of course it is just an image created in the Church, an image quite unknown to much earlier Christians, who neither knew precisely what Jesus might have looked like nor seemed to have much concern about the matter. The first Christian art, which we see in the catacombs and in the house church at Dura Europos, was an art of symbols and of simple narrative depictions, utilizing generic rather than portrait images of biblical persons including Jesus, who was sometimes shown as a beardless magician holding a wand as he performed miracles such as raising Lazarus from the dead.